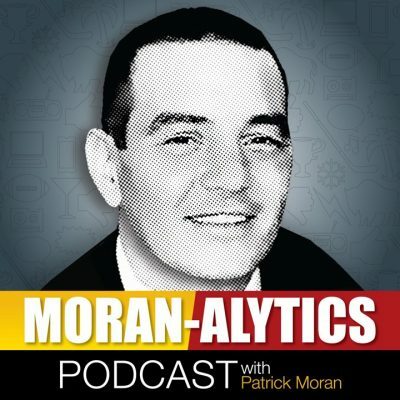 On the episode of the Moran-Alytics Podcast, Patrick Moran interviews longtime Buffalo sports media veteran Kevin Sylvester on a wide variety of topics, dating all the way back his growing up in Waterloo, New York. During a career that’s now spanned more than two decades, Sylvester’s pretty much done it all when it comes to sportscasting, particularly in the Western New York region. He’s worked on the radio side at WGR multiple times as well as WBEN while also spending 11 years with the Buffalo Sabres in several different roles. Sylvester runs through what those experiences have meant to him. They also spend time discussing some of Sylvester’s current projects, ranging from co-starting Buffalo Sports Page with fellow local media guy Paul Peck to co-hosting the Half Hour Hockey Show with Kevin Snow to his work on PGA Tour Radio covering various professional golf events. The topic then turns to the Sabres and Sylvester offers his thoughts on the team’s recent slide and if missing the playoffs could result in the firing of Phil Housley at season’s end. They finish up with the Mini-Lightning Round where we learn several of Kevin’s favorites, including the three dinner guests he’d love to have, his favorite non-sports hobby and the Twitter handle that’s his biggest must-follow. You can follow Kevin on Twitter @KevSylvester and be sure to check out both Buffalo Sports Page and the Half Hour Hockey Show. After that interview Moran is joined by Tone Pucks (@tonepucks) for another installment of “Pat with Pucks.” Today the guys are discussing the AFC and NFC championship games at Sunday and Moran admits to the world that by the end of the day he found himself actually rooting for Tom Brady. Pucks weighs in on the blown pass interference call costing the New Orleans Saints a trip to the Super Bowl and the two spend time talking about the Buffalo Bills, including agreeing on being fine with the team using a top 10 pick on a defensive lineman and eagerly awaiting to see how the team addresses the tight end position once they inevitably release Charles Clay.